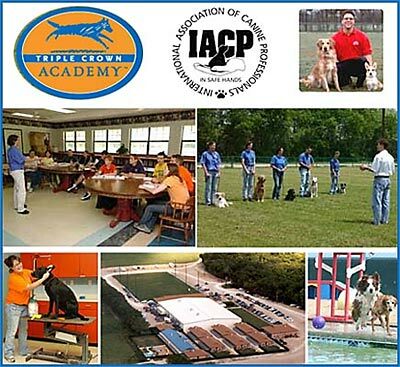 Triple Crown Academy, school for dog trainers is a state approved trade school that offers certification in the science of dog training and will give you a foundation for success! What Makes Triple Crown Academy Better Than Other Schools? Triple Crown Academy offers the most comprehensive hands-on program in the country. No other school will better prepare you for a career in professional dog training than Triple Crown. While attending Triple Crown Academy, you will be training under the supervision of qualified instructors on a daily basis, who will provide you with critical feedback to ensure that you develop your skills to the best of your potential. something for everyone, from the pet owner to the dog sports enthusiast; including training in basic companion obedience, solutions for common behavior problems, agility, police K-9, search and rescue, assisted therapy, bomb and narcotic detection, tracking, Schutzhund, competition obedience, trick training, and retriever training. What Training Methods Are Taught At Triple Crown Academy? At Triple Crown Academy you will learn how to use a wide spectrum of training tools and techniques that will give you a solid foundation on which to build your dog-training career. Triple Crown will show you how to use a variety of safe, effective, and humane methods to train a wide variety of dogs. Based on their temperament, different dogs can call for different training methods and tools. You will learn how to correctly and safely use many different types of training equipment from the Clicker to the Remote Collar. Our broad curriculum includes both lecture and hands-on training. You will learn the science behind dog training, as well as its practical application. You will have the opportunity to observe and participate in both group and private lessons, as well as work with some additional dogs that are in training. This allows you to work with a variety of Breeds And Temperaments. Will I Be Able To Instruct People As Well As Dogs Following The Completion Of This Course? Yes. We feel that you must be able to instruct people as well as dogs. It is important that you can articulate your training methods to your prospective clients so they may maximize what they have learned. You will learn how to instruct private lessons, group classes, in home lessons as well as In-kennel training while attending Triple Crown Academy. Does Your Academy Offer Financial Aid? Absolutely! For complete details please visit our website. What Do Graduates Say About Triple Crown Academy? "Triple Crown Academy will force you to dig down deep inside and take a look at yourself and your relationship with your dogs. It will challenge you every day. Be prepared to grow and learn as both a person and a dog trainer. If proved to be an excellent experience that I could not have gotten elsewhere. Thank you Triple Crown, for showing me what a great trainer I can become." This School Sounds Great! How Do I Sign Up? Please visit our website for the necessary forms and pricing guidelines. Start Your Dog Training Career Today! If you are serious about joining the lucrative dog training industry, look no further! At Triple Crown Academy we will give you all the skills you will need to become an expert trainer! So what are you waiting for? Sign up today!